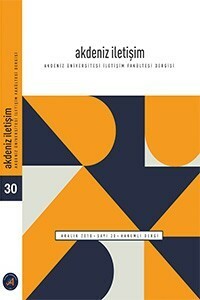 The Journal of the Faculty of Communication of the University of Akdeniz is an academic, electronic (eISSN: 2619-9718) and "feminine" international journal published in the field of communication. The Journal of the Faculty of Communication of the University of the Mediterranean is a periodical which considers the interdisciplinary nature of the field of communication and recognizes that all academic studies in various fields are valued and as a priority publication to contribute to the development of literature in the field of communication in our country. It is published by the Faculty of Communication. Journal of the Faculty of Communication of the University of the Mediterranean, ULAKBİM is a well-regarded journal which is searched by SBVT. It is also scanned on the EBSCO database. It is published twice a year. The magazine is written in Turkish and English. Büyük Veri ve Gazetecilik: Veri Gazeteciliği Demokrasi, Katılım ve Gazeteciliğe Dair Anlayışımızı Nasıl Dönüştürebilir?